Today, we are discussing the benefits of eating yogurt. At Art of the Home, yogurt is a part of our daily diet. We eat at least one serving of yogurt per day — as do many French women in fact (and children too as encouraged by their mothers). Yogurt comes in many varieties, so whether they are homemade or store bought, you can feel like you have a different dessert every day (or breakfast or snack depending on when you eat your yogurt). Check below for our top 5 reasons to eat yogurt and get all of the goodness that yogurt can offer. Enjoy and bon appétit! Yogurt for strong bones: yogurt is rich in calcium which is known to be excellent for healthy bones. In addition, yogurt contain lactoferrin, a glycoprotein that boost cells responsible for building bones (osteoblasts). By the presence of calcium and lactoferrin in yogurt, eating yogurt may be a big help in preventing osteoporosis (reduction in bone mass) and contribute to healthy growing bones for children during their formative years. Yogurt helps digestion: the process of making yogurt includes “good” bacteria (probiotics: lactobacillus bulgaricus and/or streptococcus thermophilus). Those probiotics have strange names but they are great friends to our intestinal track. In particular, by eating yogurt with active bacteria (or live cultures) you are adding those “good” bacteria to your intestinal flora that will neutralize the “bad” bacteria. 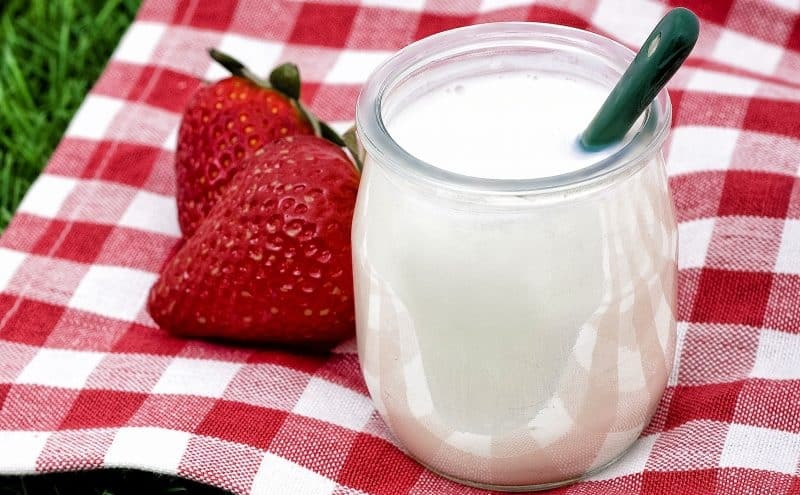 Another benefit is that those probiotics help break down lactose (sugar found in milk, cheese, and other milk products) so yogurt is a dairy product that is easier to digest — a nice option if you are lactose-sensitive. Make sure to check that the label has a “National Yogurt Association’s Live & Active Cultures” seal to ensure they were made with live cultures. Yogurt helps your immune system: by eating yogurt with live cultures and adding those “good” bacteria to your body, you help fortify your immune system. Further, yogurt is often suggested for patients that take antibiotics to add back good bacteria often killed as part of the antibiotic treatment. Yogurt also provides B vitamins (Vitamin B2, Vitamin B5, Vitamin B12) which among other things, enhance immune function. Yogurt can help you lose weight: yogurt is an important partner if you are trying to lose weight. Vitamin B found in yogurt boost your metabolism so it is not quite like getting on the treadmill but this increase in metabolism may help you with weight loss. Also, yogurt has protein which helps you feel full longer. The reason you feel less hungry is that proteins take longer to digest so you will feel satisfied longer than with a non-protein based dessert. If you are looking for a protein boost with your yogurt, we suggest Greek yogurt. They are a great option with almost double to amount of protein per serving as compared to a regular yogurt. Yogurt, a delicious dessert: yogurt is a low calorie, nutritious and delicious alternative to other high calorie desserts. And feel free to spice it up with fresh fruits, honey, jelly, prunes, or a small handful of cereal for some crunch. Enjoy!